Here’s a fun entry into our coin cell challenge. The power source is the actuating force in [Frank]’s blinky LED Christmas tree, which takes advantage of the physical structure of coin cells and our old pal gravity to roll out some holiday cheer. Talk about forward voltage! We love the concept, and the circuit couldn’t be more simple. A coin cell is released at the top of the tree and rolls down a series of angled foam board railings covered with 1/4″ copper tape. As the coin cell travels, the negative terminal shimmies along the face of the tree, which has corresponding ground rail tapes. There’s no microcontroller here—all that’s needed for blinks are breaks in the negative rail tape. The challenging part of a project like this is the execution. Getting a coin cell to ride the rails without falling off required angle experimentation prior to and during the build. Now that it’s done, keeping the tree tilted back against the wall is key. [Frank] explored several options for returning the coin cell to the top using a camera motor and the gear assembly from an old inkjet, but for now, his six-year-old does the job without complaint. Check out his work ethic after the break. Whether coffee, tea, or beer is your jam, brewing is a delicate pas de deux of time and temperature. Proper brewing of any of these beverages can elevate the experience from average to amazing. With this in mind, [Marcelo] created a time and temperature tool to dial in his beer-brewing process. BrewBuddy is a complex application-specific timer with an integrated thermometer. It lets him program time and temperature profiles for both the mashing process and the boiling process and store up to 10 steps for each. BrewBuddy doesn’t control the brewing temperature, but it does unify temperature-taking and time-marking into one convenient device that can last about 20 hours on a single CR2032. The system is based on an STM32 and an LMT86 analog temperature sensor which has been modified to sit inside a stainless steel tube. There are four directional buttons to navigate through intuitive menus to set the desired times and temperatures. As each step completes, the status LED lights up and BrewBuddy waits for confirmation via button push before moving on to the next step. If there’s a problem, the timer can be paused and resumed using the up/down buttons. [Marcelo] is working to perfect the case design, but he already has the board files and firmware up on GitHub. Open up a cold one and check out the demo videos after the break. After boiling and cooling comes fermentation, and that requires careful monitoring of the sugar content. Here’s a tool for that. This is it. This is the last weekend you’ll have to work on the most explosive battery-powered contest in recent memory. This is the Coin Cell Challenge, and it’s all ending this Monday. 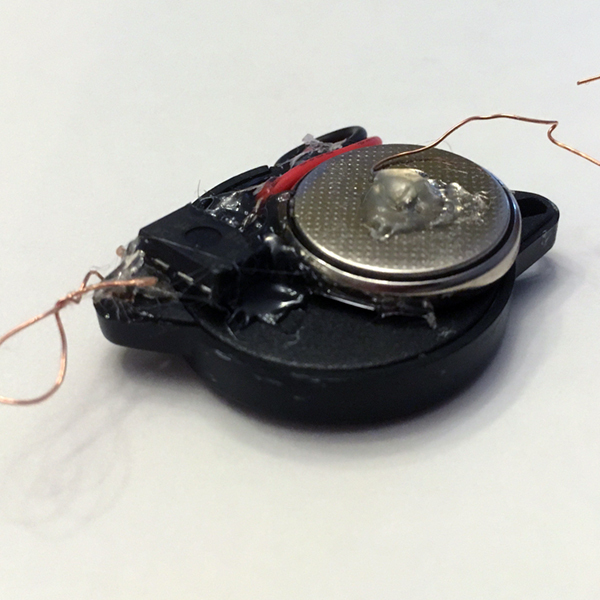 You have less than 48 hours to create the most amazing thing powered by a coin cell battery. Right now, we’re looking at the entries to the Coin Cell Challenge, and there are some real gems here. Did you know the Rickroll Throwie maddeningly distributed around the dorms at Cornell is an entry? Yes, with just a coin cell, an ATtiny85, and a piezo, you can rickroll people for an entire year. Need some more inspiration? Anthropomorphized pool noodles need love. CES is coming up next weekend, which means you too can get kicked out for life, just like Gizmodo reporters. The Northeast is suffering through a cold snap right now, so let’s try jumpstarting a car with a coin cell battery. There are a million and one things you can do with a coin cell battery, and we want to see what you can do with them. The top twenty projects for this contest will each receive $100 in Tindie credit to pick up some fancy kits and cool gear. The three top winners will each receive a $500 cash prize. We’re looking for three things specifically — a Lifetime Award that keeps a project going longest, a Supernova Award that drains a coin cell in the blink of an eye, and a Heavy Lifting Award that demonstrates what shouldn’t be possible with a simple coin cell. This is your last weekend to submit a project, and the contest ends Monday afternoon, Pacific time. Enter now! Take the Coin Cell Challenge This Weekend! The year is drawing to a close, and we have a weekend project for you to while away the remaining hours. Take the Coin Cell Challenge! The point of the challenge is to do something interesting with a coin cell. That’s it! It’s a challenge that can be as simple or as involved as you want. Low power is where it’s at these days, so if you’ve never used the hardware sleep modes in your favorite microcontroller, that would make an excellent challenge entry. Show us what you’re able to do with short wake periods, and talk about when and why that wake happens. Or go a completely different route and build your own cell! The top twenty entries will each receive a $100 Tindie credit so they can score some excellent gear. Three top winners in some special areas who will each be awarded a $500 cash prize. We’re looking for something interesting that demonstrates longest life (Lifetime Award), something that burns through that coin cell as if it’s going out of style (Supernova Award), and something that fills us with disbelief (Heavy Lifting Award) because it shouldn’t be possible with “just a coin cell”. 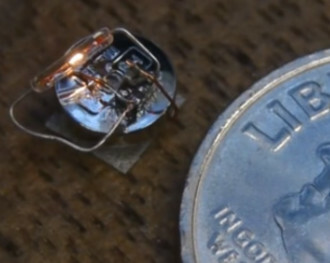 One of our biggest inspirations for this contest was [Ben Krasnow] who managed to squeeze enough juice out of a miniscule coin cell to power his Flashing Light Prize entry, only because he reduced internal resistance by heating the cell with an air gun (here’s the Hackaday coverage of that project). And [Elliot Williams] wrote a great guide on what kind of juice you can expect to get out of a cell. Take these to heart and do something interesting this weekend. Enter now! We didn’t include a “Most Ornate” category in this year’s Coin Cell Challenge, but if we had, the environmentally reactive jewelry created by [Maxim Krentovskiy] would certainly be the one to beat. Combining traditional jewelry materials with an Arduino-compatible microcontroller, RGB LEDs, and environmental sensors; the pieces are able to glow and change color based on environmental factors. Sort of like a “mood ring” for the microcontroller generation. [Maxim] originally looked for a turn-key solution for his reactive jewelry project, but found that everything out there wasn’t quite what he was looking for. It was all either too big or too complicated. His list of requirements was relatively short and existing MCU boards were simply designed for more than what he needed. On his 30 x 30 mm PCB [Maxim] has included the bare essentials to get an environmentally aware wearable up and running. Alongside the ATtiny85 MCU is a handful of RGB LEDs (with expansion capability to add more), as well as analog light and temperature sensors. 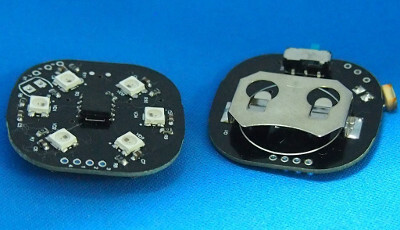 With data from the sensors, the ATtiny85 can come up with different colors and blink frequencies for the LEDs, ranging from a randomized light show to a useful interpretation of the local environment. It’s not much of a stretch to imagine practical applications for this technology. Consider a bracelet that starts flashing red when the wearer’s body temperature gets too high. Making assistive technology visually appealing is always a challenge, and there’s undoubtedly a market for pieces of jewelry that can communicate a person’s physical condition even when they themselves may be unable to. Form or function, life saving or complete novelty, there’s still time to enter your own project in the 2017 Coin Cell Challenge.